Valery Gergiev conducts revelatory performances of Scriabin’s Symphony No.3 ‘The Divine Poem’ and Symphony No.4, ‘The Poem of Ecstasy’. 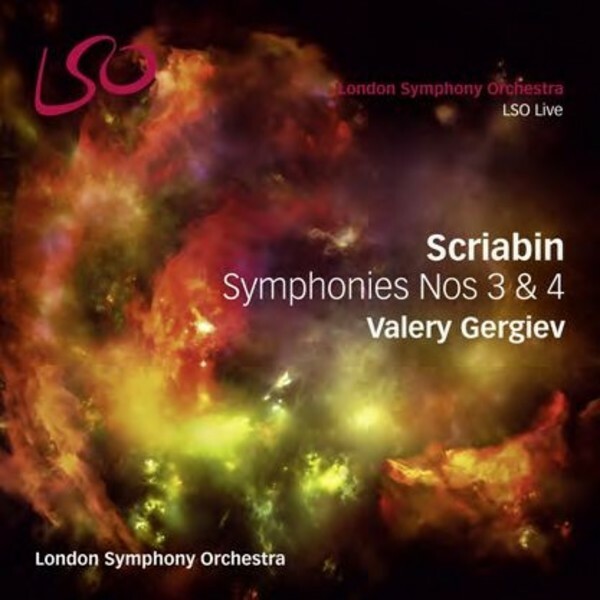 This marks the first in a new cycle of Scriabin symphonies, and one of the most significant of all Valery Gergiev’s projects with the London Symphony Orchestra, released during his final tenure as LSO Principal Conductor. Anyone with musical curiosity will welcome the chance to explore such an idiosyncratic composer. Scriabin’s Symphony No.3 was composed not long after the composer had arrived at a philosophy that exalted the individual ego and the senses. The piece, which has also been referred to as a tone poem in three movements, was Scriabin’s attempt to give expression to the evolution of the human spirit. For Scriabin, the finale of his Third Symphony marked a significant moment in his development as a composer, and he wrote that "this was the first time I found light in music… the first time I knew intoxication, flight, the breathlessness of happiness". By 1906 Scriabin had published a poem which set out the ‘philosophical programme’ of a work, which was to become his Fourth Symphony. The work’s title refers to an artistic ecstasy, which is expressed in the music through a beautifully coloured sound-world and harmonic fluidity, culminating in the final section with the revelation of C major. Scriabin was influenced by synesthesia, and associated colours with the various harmonic tones of his atonal scale, while his colour-coded circle of fifths was also influenced by theosophy. Valery Gergiev says of the composer: "Scriabin is a great Russian composer… He’s clearly a composer with his own voice, from his own world. Scriabin came up with very much his own sonority and his ability to hear different colours was legendary. Scriabin should be today understood as a man who was able to create a wonderfully magical musical world, and we just have to give in. We have to be imprisoned by these compositions and the magical powers of the creator."